About 10 lakh people fall prey to cancer every year in India. According to a report by the Indian Council For Medical Research, the number of cancer patients is likely to rise from 14 lakh in 2016 to over 17.3 lakh by 2020. The number of cancer cases is rising fast. So is the cost of treatment. Considering the exorbitant treatment costs, which can go up to Rs 20 lakh, it makes sense to buy an insurance plan. To meet this requirement, some insurers have launched plans that cover all types of cancers, though their number is not significant yet. "There is no competition in this market, because there are not enough products," says Sameer Kaul, Sr. Consultant, Surgical & Clinical Oncology, Apollo Cancer Institute. A cancer insurance plan is a fixed benefit plan that offers lump sum pay-outs at different stages of the disease. The age limit is 70 years. The policy term can be five to 70 years. The sum assured provided by insurers is as low as Rs 2 lakh and as high as Rs 50 lakh. "We have an ageing population and cancers such as that of prostrate and colon are quite common after the age of 60-65," says Kaul. A cancer-specific policy offers cover for diagnosis and treatment costs, including hospitalisation, chemotherapy, radiation therapy and surgery. The payment is usually made at different stages of diagnosis - minor, major and critical. "For six months of treatment, it can cost from anywhere between Rs 2.5 lakh to Rs 20 lakh depending on the stage and type of treatment," says Martijn De Jong, Chief Digital Officer, Aegon Life. These plans are pure protection plans and do not offer any benefit in case the policyholder survives the policy term. Typically, three stages of cancer are covered - Carcinoma in Situ (CIS) or making of a tumour, early/minor stage, and major/critical stage. If a person is diagnosed with CIS, early or minor stage, 20-25 per cent payout is made (this varies from insurer to insurer). For major/critical stage, the payout is usually 100 per cent, but there are also a few plans where the payout is 150 per cent. However, if 25 per cent payment has been made in the early stage, this will be deducted from the payment at the major stage (only 75 per cent sum insured will be paid at the major stage). For instance, in HDFC's Cancer Care plan, at the early stage, 25 per cent sum assured is paid. The rest of the premium is waived off for three years. The remaining 75 per cent is paid at the major stage and the policy terminates. In Aegon Life's iCancer plan, for each claim, 25 per cent sum assured, minus the previously paid claims, is paid, up to a limit of Rs 5,00,000 per claim. At the major/second stage, the plan pays 100 per cent sum assured, minus all previously-paid claims. Once a major stage claim is approved, all future premium payments are waived for the remaining policy term. At the critical stage, the insurer pays 150 per cent sum assured minus all previously-paid claims and the policy terminates. While choosing a plan, apart from looking at the different types of cancer it covers, one should also see if all stages are covered. Insurance companies enquire about pre-existing diseases while underwriting health policies. Pre-existing cancer is not covered. "There are certain exclusions under cancer policies and hence the insured should look at policy wordings carefully," says Santosh Agarwal, Head of Life Insurance, Policybazaar. Certain cancers such as skin cancer are not covered. Cancers that are directly/indirectly caused by or contributed to by sexually transmitted diseases, HIV or AIDS, are also not covered. A cancer plan is a benefit-based policy that covers all expenses of cancer treatment whereas critical illness insurance plans provide lump-sum benefits for a number of critical illnesses. "Chances of recovery from cancer are the highest when it treated early. This is where cancer insurance plans score over critical illness plans," says De Jong. Critical insurance plans cover cancer too. Mostly, they pay a pre-defined amount upon diagnosis of any critical illnesses listed in the policy document. Another major difference between cancer plans and critical plans is that most cancer plans offer stage-based payouts and cover all stages of cancer. Critical illness plans cover illnesses mentioned in the policy document and the policyholder can spend the payment as he or she wishes to. "When you look a little deeper you realise that critical illness plans cover cancer at advanced stages and not preliminary or minor stages," says De Jong. However, even if one is at an average risk of developing cancer depending on one's family history, having just a standalone cancer product is not a good option; cancer insurance plans are no replacement for health insurance policies. Cancer has always been one of the most dreaded diseases. But what is equally daunting are the treatment expenses. Premium calculation is done on the basis of sum assured, policyholder's age, gender, coverage term, health and family history. One can also claim tax benefit under Section 80D on the premium paid. "The products that are available are not mature enough to cover cancer; the amount insured is always less than the actual treatment cost," says Kaul of Apollo Institute. And, after a person gets cancer, he or she cannot buy the cover as it is considered a recurring disease. One should look at the benefits, features and exclusions and compare premiums based on these. 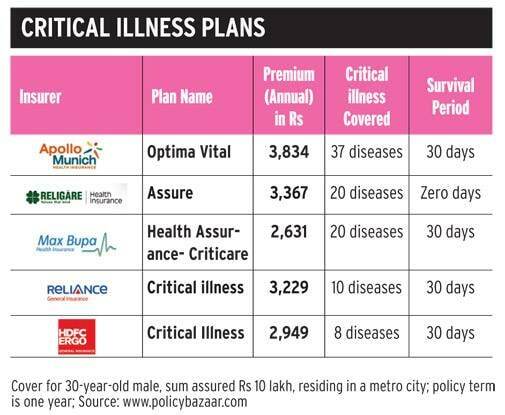 "The best cancer plan should cover all stages of cancer, pay at every stage, have a long policy term, provide benefits such as premium waiver and have no survival period," says Santosh Agarwal of Policybazaar. "People who already have a health insurance plan or a critical illness plan should also opt for cancer insurance as a top-up," says De Jong. Health insurance or mediclaim policy covers actual hospitalisation expenses, but there are always some add-on expenses that it does not cover. The payout from these cancer plans is received in addition to one's mediclaim. "Cancer plans can be availed of by all and should be taken as a supplementary cover in addition to mediclaim policies," says Sujoy Manna, VP - Product, HDFC Life.